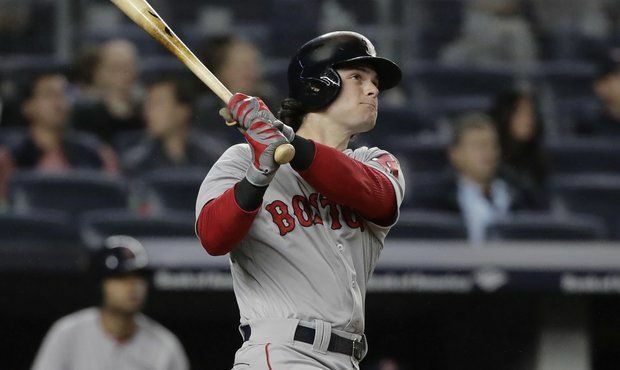 The Red Sox slammed three home runs and Drew Pomeranz somehow managed to get through five innings as Boston beat the Yankees 5-4 on Tuesday night in the Bronx. Mitch Moreland, Hanley Ramirez and Andrew Benintendi each took Yankees starter Masahiro Tanaka deep as the Red Sox moved to within a game of first-place New York in the American League East. Pomeranz labored through his five innings, throwing 123 pitches over that span. Was it your imagination or was he 3-2 to almost every Yankee hitter he faced? He allowed six hits and walked a pair while striking out seven to improve his record The Red Sox and Yankees traded single runs in the first two innings before the Boston bats really went to work. Moreland and Ramirez each homered in the fourth to give the Sox a 4-1 lead. Benintendi (pictured) hit his eighth of the year with two out in the fifth to increase the lead to 5-1. New York rookie phenom Aaron Judge was part of two epic at bats - one against Joe Kelly in the seventh in which Kelly hit 104 MPH on one pitch, and the other in the ninth off Kimbrel in which he fanned on three pitches of 99 MPH or better. Craig Kimbrel struck out the side in the ninth inning to record his seventeenth save.